My favorite 5-year old, Isaac, is a Lego Maniac for sure. This late in the life of Legos, there is probably a Lego gene. Like father, like son. So Lego knitting sounded like good birthday-present knitting. This is Amber Allison’s free pattern, Some Assembly Required. 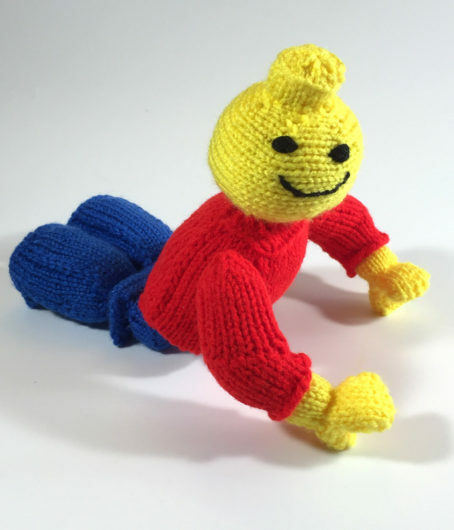 It looked like it might be a stretch even for someone experienced in knitting toys. I didn’t want to invest a lot in yarn if the project proved a bust. Plus these Red Heart Super Saver colors were perfect! This was a terrifically fiddly knit. But I still enjoyed making it because with these things you always keep your eye on the prize. 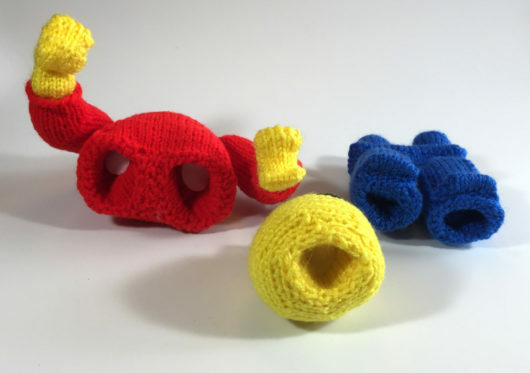 The prize is that some little person will like what you knit. My Lego guy is just under 12 inches fully assembled. And Isaac likes him. Not every Lego maniac is 5 years old. I can see this guy sitting on plenty of adult desks. Isaac was also a big fan of this part of his Lego birthday package. 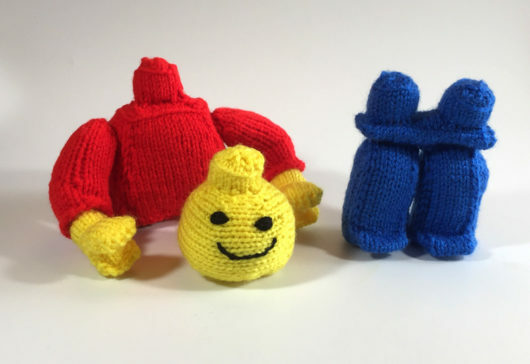 These Lego mitts might even turn up as part of Isaac’s Halloween costume. Mix ‘n match works on a chilly night. 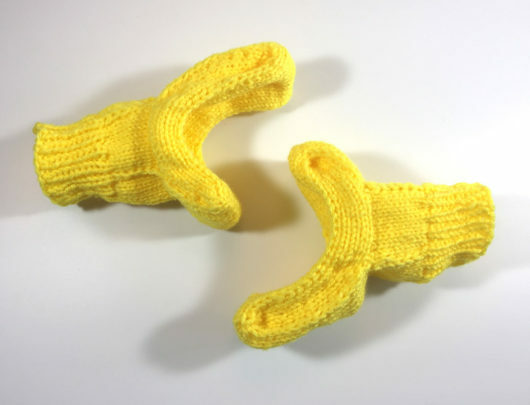 They are another freebie, this time by Carissa Browning, Lego Man Mitts. The pattern includes 6 sizes, from baby to large adult. And the package was all done up in very special wrapping. 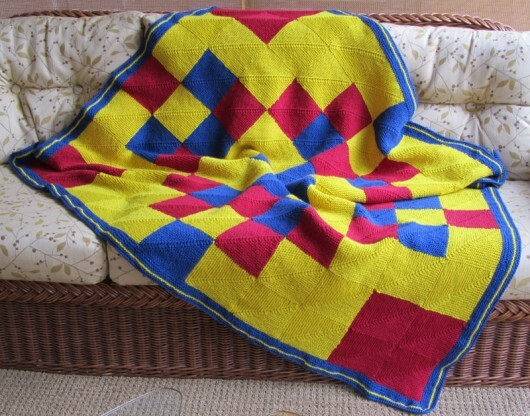 This is Celia’s Blankie, a wonderful Carol A. Anderson Cottage Creations pattern. My Lego version of Celia’s blanket is knit in Plymouth Yarns Galway worsted and Paton’s Classic wool. You can read more about my modifications here. It will be a very warm very cozy blanket. I knit it in 2014 and packed it away until it was the right time for gifting. My knitted Lego package was a big hit. 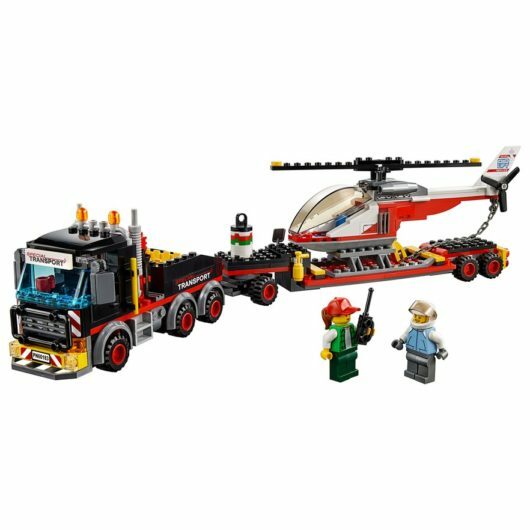 But it is true that this grandmother decided to add to the allure of the gift by including a Lego City heavy cargo transport. 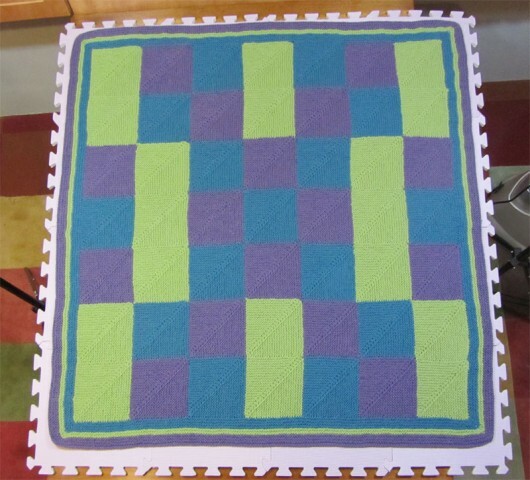 Celia’s Blankie is a simple stylish baby blanket pattern by Carol Anderson, of Cottage Creations. Carol is well known for her chatty style in writing patterns. Lots of details are given. You feel as if she’s sitting in the room guiding you along. I like that. Her booklets can sometimes be hard to find in local yarn shops. But now the patterns are available through her website. Great move, Carol! In my first Celia’s Blankie, I made it basically toddler-sized. This one almost covers a queen-sized mattress. It was designed as a stash buster. There’s almost 3400 yards of wool knit into this garter stitch blanket. 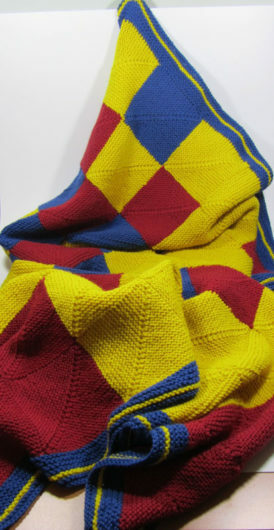 The red and blue are Paton’s Classic Wool and the yellow, oh my that bright yellow, is Plymouth Galway worsted. Two no-nonsense, workhorses. Never mind how I managed to stash so much of these yarns, but it all had something to do with a sale. It’s 9 mitered squares wide and 11 squares long, with a 14 row garter stitch border all around. I’d be fibbing if I told you it was a quick knit. It will be warm. It will cheer up a room. And it reminds me of all the fun my son used to have playing with his Legos. 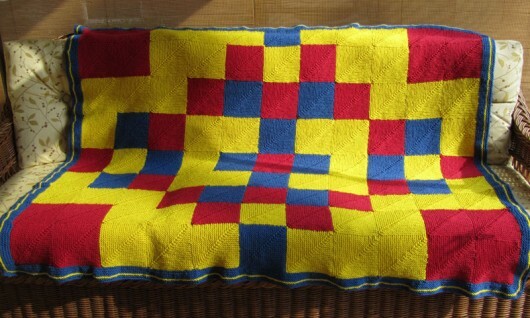 This is Celia’s Blankie, another modular-knit afghan from Carol Anderson at Cottage Creations. 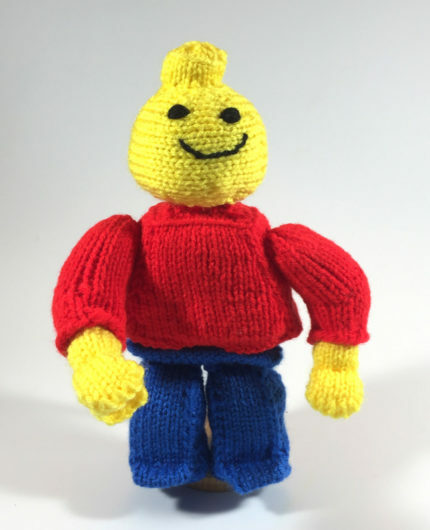 Anderson’s website is not set up for e-commerce or downloading patterns, but the pattern booklet is available on a number of websites and local yarn shops and she invites direct inquiries to her. 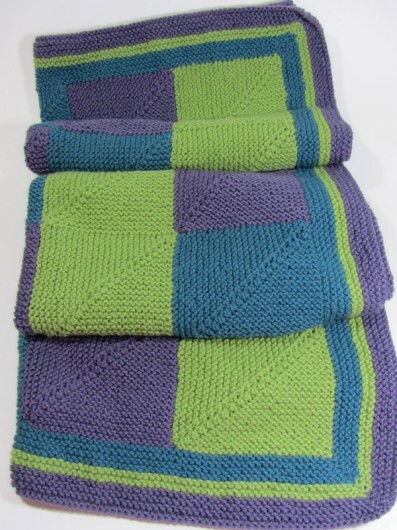 Miles of garter stitch is a big draw for me and so are Cottage Creations patterns. The instructions are very clear, but also quite chatty. Rather rustic drawings illustrate some sections of Cottage Creation patterns. As with Rambling Rows, which you can check out here and here and four more here, when you finish Celia’s Blankie, there is no finishing. 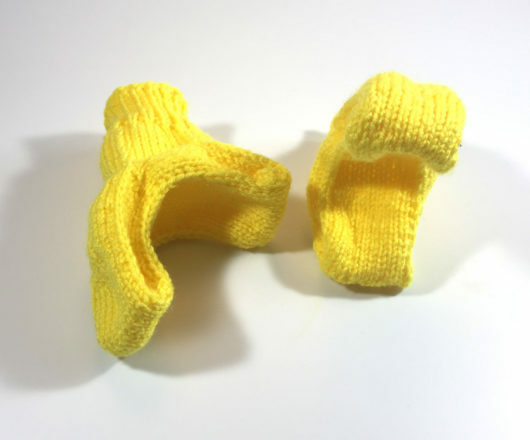 You will likely chose to work in the tails from the individual blocks as you knit and, if so, it’s off the needles and your finished blanket can be immediately put to use. My blankie is knit in easy-care Plymouth Encore worsted. I knit the largest size square the booklet suggests and ended with a blanket that was 45 inches by 46 inches, including the 10-ridge garter stitch border. Anderson leaves a lot of choices for the knitter, including the size, number and color-patterning of squares. Since it’s knitter’s choice, the pattern doesn’t spell out exactly how much yarn you’ll need. I found I was able to get 7 squares out of all but one of the Encore skeins, on US size 8 needles. This blankie took 3 skeins of each of the 3 colors I chose. 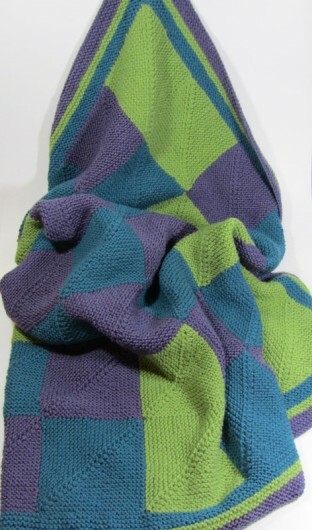 The booklet provides photos of several blankets knit by several test knitters, with information on their choice of yarn and how much yarn they used. I selected one of the arrangements used by one of the test knitters. There isn’t any reason why you couldn’t put this pattern on steroids and knit a full size blanket. Just knit more squares. For the border, I picked up 24 stitches in each square, working garter stitch in the round with my longest circulars. Garter stitch in the round means you knit one row, purl one row. I marked each corner with a stitch holder and then each knit row I increased one stitch (by knitting in the front and in the back) on each side of the marker. I bound off on a purl row.